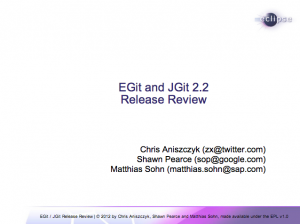 The JGit and EGit teams are happy to announce the 2.2 release. What’s new? I recommend checking out the JGit New and Noteworthy along with the EGit New and Noteworthy documents. While there were a lot of new features, my favorite feature is the performance improvement in EGit for re-indexing repositories (it’s now done incrementally, see bug 393642). Enjoy and happy holidays! The next release will be in mid February.